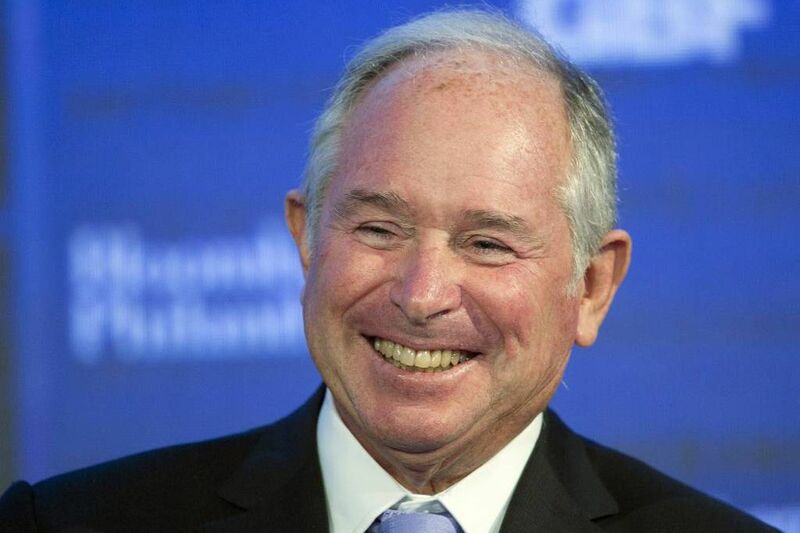 Blackstone Group chairman and CEO Stephen Schwarzman has given a $25 million gift to Abington High School. Stephen Schwarzman became a billionaire on Wall Street and a close friend of President Trump but never forgot his years at Abington High School, where he starred in track and won the student council presidency – a bond he sealed Wednesday with a staggering $25 million gift to remake his Montgomery County alma mater. The Blackstone CEO – whose name is already on Abington's football stadium after a $400,000 donation in 2005 – said in a prepared statement he hopes the giant gift for a new science and technology center as well as a complete renovation of the high school from which he graduated in 1965 will spur other wealthy donors to support public education. Schwarzman has known Abington Superintendent Amy Sichel for more than a decade. According to an item from the Politico Playbook in February 2017, Sichel was spotted at a 70th birthday party for Schwarzman at his Palm Beach estate that was also attended by Jared Kushner and Ivanka Trump as well as cabinet members Steven Mnuchin and Wilbur Ross. Sichel said she has been talking to Schwarzman for more than a year about the gift and how it could be used to transform education at the 1950s-era high school, which is undergoing an expansion and renovation. "I knew for us to do this kind of a project … that the financial resources of a suburban public school …could not manage the extent of the renovation and addition we wanted to do," said Sichel, a school psychologist who is among the highest-paid superintendents in the state and was appointed to the top job in 2001 after working in the district since 1976. The older, densely populated Montgomery County school system has 8,200 students. Such large gifts are uncommon for public schools, but in recent years rich donors have sought to help cash-strapped schools in need of resources. Schwarzman's gift — one of the largest to a single school — follows those of comedian Stephen Colbert, Facebook founder Mark Zuckerberg, author Stephen King, and philanthropists such as Bill Gates and the Walton family, among others. Schwarzman and Sichel plan to tout the gift at a national education conference Thursday in Nashville. In a news release Schwarzman noted that 90 percent of American youth attend public schools, "which means investing in public education yields one of the best returns imaginable – a new generation of creative, capable and collaborative future leaders who are prepared to succeed in the evolving workforce. I owe a debt of gratitude to Abington High School and passionately believe that the next generations of students are entitled to an education that provides the tools needed to prepare them for future success." He called on others to join him "in an effort to spark a much needed shift in how we support the more than 50 million students receiving a public education today." The private equity executive has supported other education endeavors, including a $40 million gift to the Inner-City Scholarship Fund in New York City in 2015. In 2013, he founded an international scholarship program, "Schwarzman Scholars," at Tsinghua University, in Beijing, to help prepare the next generation of global leaders. The science and technology center, which will include a virtual-reality lab and a robotics lab, is scheduled to open in 2020 and the renovated high school in September 2022, Sichel said. The donation is covering about 25 percent of the projected cost of the project, said Raymond McGarry, an attorney and president of the Abington School Board. "It's incredibly meaningful to the district, to the students, to the taxpayers, and to the residents," he said. "In life, you don't receive things like this unless you ask for them, and I'm incredibly grateful for Dr. Sichel's leadership, not only for this project but also for reaching out to Schwarzman." "We're lucky to live here," said Nicole Gesing, president of the parents council who has three children in the district. "Our kids are going to benefit so much from this." Ryan Williams, a vice president of the Abington Education Association and a parent to two district students, said he knew there was a donation coming but didn't realize how large. "It's a tremendous amount to help us out," he said. "It made me smile because I know what we were talking about for the future and where we want to go. It's just going to help the community so much and it's going to help me as a teacher." Sichel said that when she first talked to Schwarzman about the project, he "peppered" her with questions "as only Steve can." "You don't just build a building. You build a vision," she said. Schwarzman, she said, told her he was "very much behind" that vision. In a 2007 profile of Schwarzman in the Inquirer, friends from his high school days said the future "King of Wall Street" even then was competitive, high-octane, and seemed destined for success. It recounted how Sichel went to his Palm Beach home in 2004 to pitch him on donating to Abington's $1 million stadium fund drive. After scouring the renderings and grilling her about the school's standards, he agreed to donate.